Someone in Minneapolis is throwing cinder blocks at bicyclists. Someone driving a white SUV with a missing back window. The world is full of unsettling things—especially if you have to leave your house. Whether traveling by bus, bike, car, or foot, there is much to fear. No matter how softly one treads, something unpleasant—an unjust traffic ticket, a catcaller, a cinder block to the head—is surely just around the corner. Athena Currier knows this, and records some of it—in the form of essays, comics, and illustrations—on her website, The Marjorie. 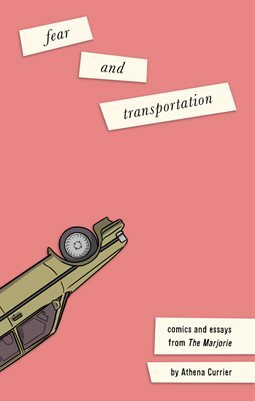 Fear and Transportation is a compilation of that work, collecting some of Athena’s favorite pieces in printed form for the first time.